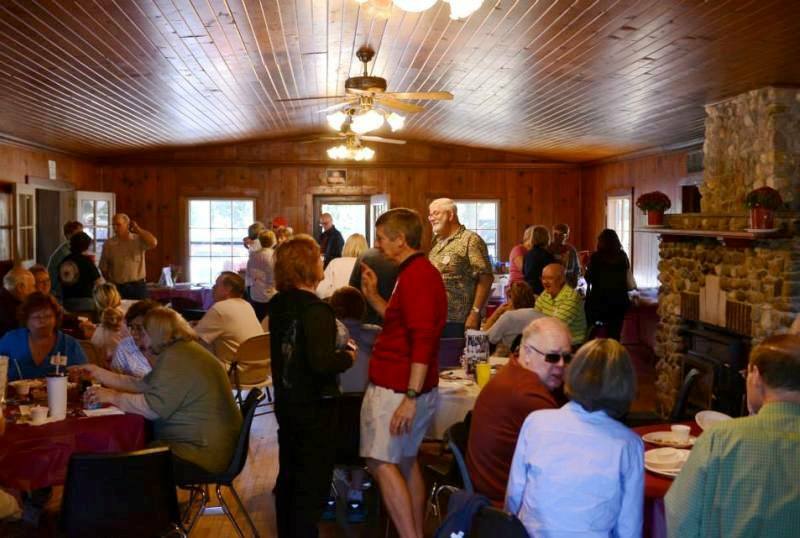 Main event of the reunion weekend was Castle Manor, all day Saturday, with midday potluck meal. Terry DeMaegd opened the doors at 7 o'clock in the morning, and we had the place all day: Huge central room with big stone fireplace, quiet side room, two restrooms, big double kitchen with center island, tables and chairs, several doors for coming and going, front porch, covered pavillion outside, plenty of parking. 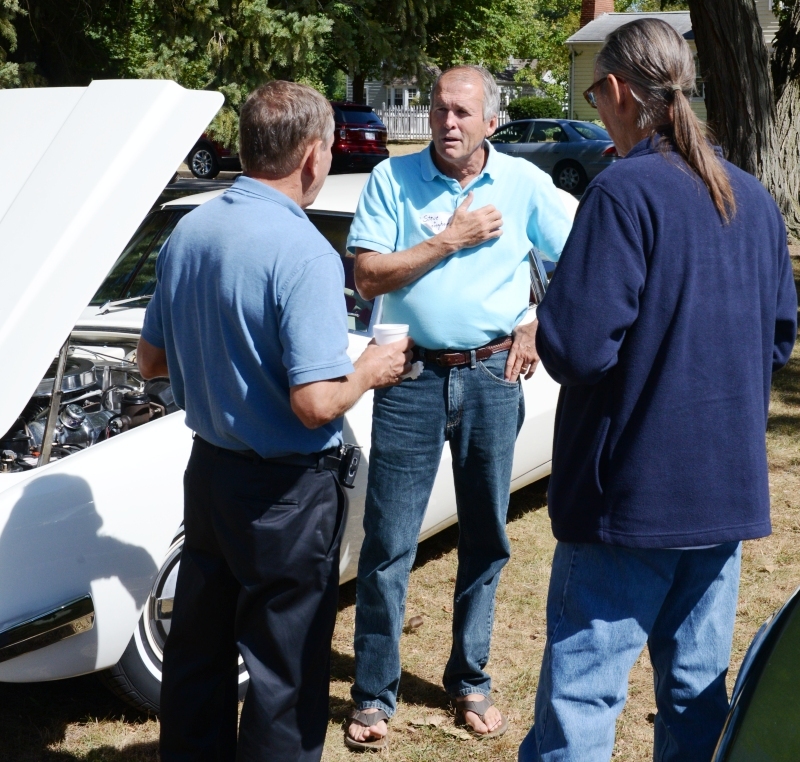 Once again, Castle Manor was home for the MHS Class of 1968 for one day. Above: Early morning at Castle Manor. Debby Parnell brought balloons and a welcome sign. Above: Terry DeMaegd arrived early and set up the tables and chairs. Toby Roose added table covers. Center pieces were by Pam Craig. Someone brought potted mums that decorated the fireplace mantel. Above: From left, Debbie Koepke, Pam Craig, Toby Roose, and Brenda Burkett were on site early to help make things look good. The one who did most of the on site interior decorating and arranging was Debby Parnell. Above: Some final arranging by Debbie Morse. Above: The spread kept growing. Two long side tables, one round table, and overflow in the kitchen. 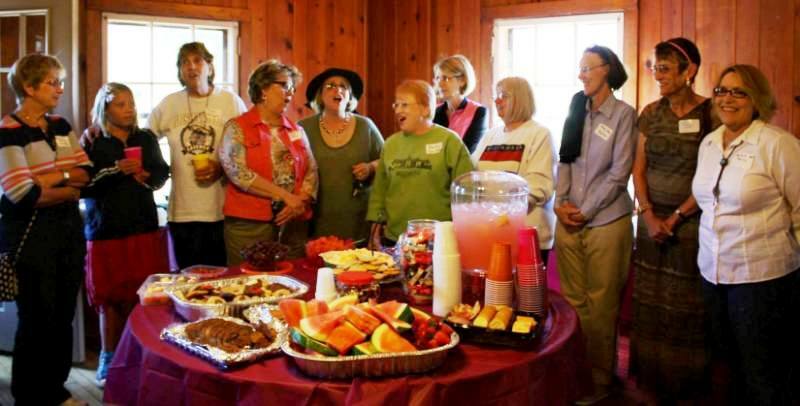 Above: Dinner was at 12:30 p.m. At 12:25 p.m., some of the women who had grown up in the Mishawaka Council of Camp Fire Girls called everyone to eat by singing the "Camp Fire Law." Castle Manor used to be owned by the Mishawaka Council of Camp Fire Girls. 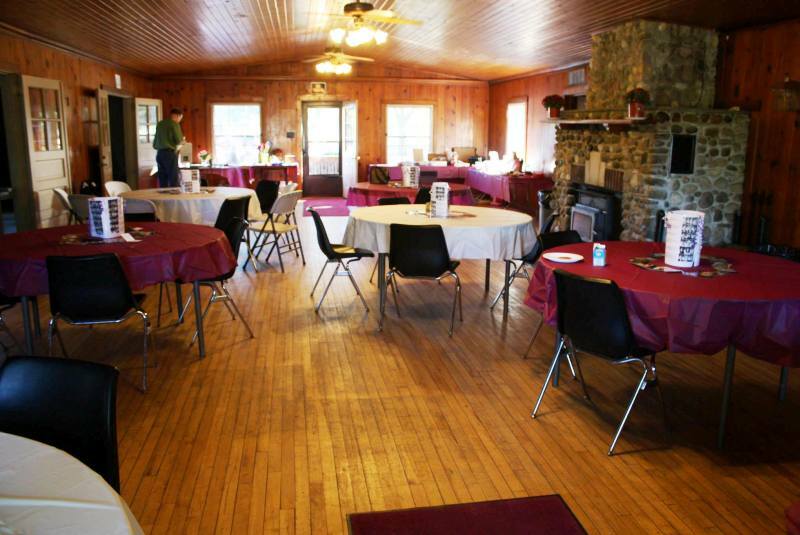 It was used for summer day camps, for Council events, and for group sleepovers. Some years past, the Council donated Castle Manor to the City of Mishawaka. Above: Time to line up for food. There was more than enough for everyone, and the choices were as complete as any restaurant menu. 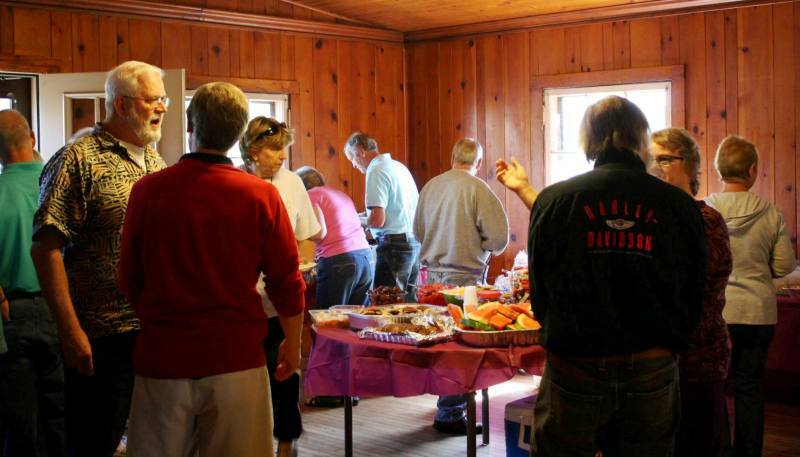 We had everything from homegrown tomatoes to Peggy Sinkovics' homemade Hungarian noodles. 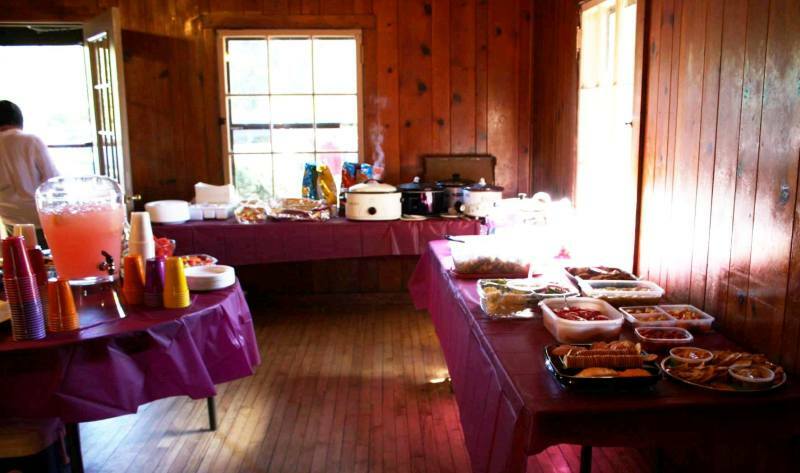 There were meatballs and chicken and German sausage and casseroles. 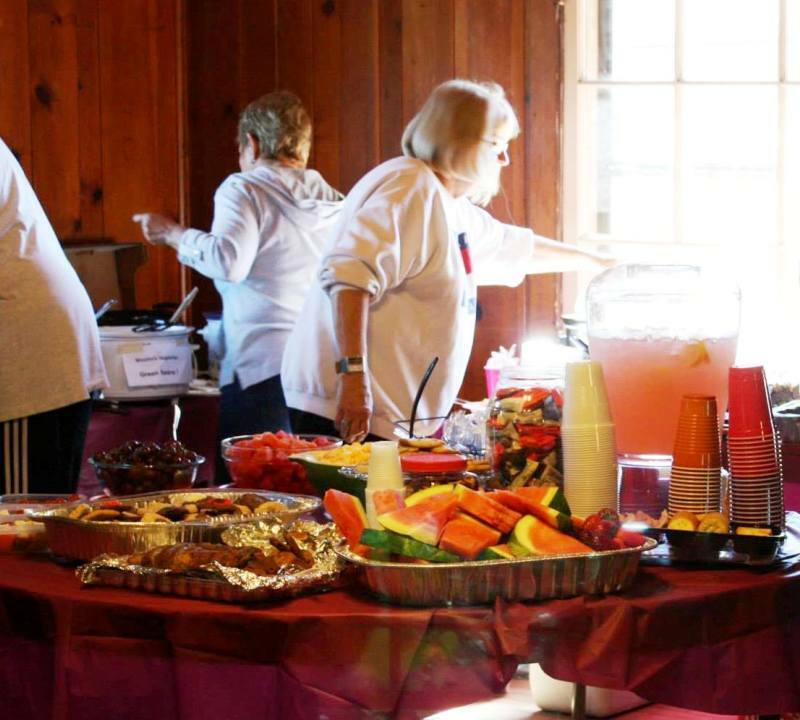 There were fresh-from-the-garden vegetables and salads and homemade deserts and fresh fruit. We had pink lemonade and beer and wine and bottled water, and even chocolate milk. Randy Smith brought homemade waffle-cookies made from his German grandpa's recipe. Everyone brought what he or she wanted to add to the table, and Debby Parnell arranged it all to look as if there had been a master plan. Above: The center pieces were by Pam Craig. Each three-sided centerpiece was made from Pam's 1968 yearbook. Surrounding the center display were photos from past reunions, to look at and to remember when being 48 was being young. Above: Mid-day meal, and the socializing and catching up moved into full swing as we chowed down. Above: Time to move to the kitchen for dessert. From left, Spider Draves, Dave Hoskins, Bill Hickey. Above: More gathering in the kitchen. 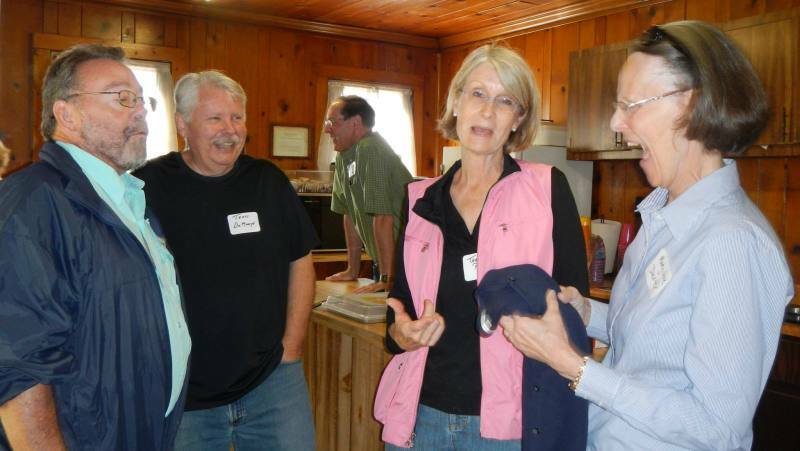 From left, Mike Squibb, Terry DeMaegd, Pete Dexter (in distance), Tamara Reed, Mary Jane Dexter. Above: Tamara Reed brought her parents' quadricycle. Pat Long explained to Brenda Burkett how to manipulate it. Above: After dessert in the kitchen, it was time to go outside and check out the cars. The car is Joe Swift's 1956 Avanti. 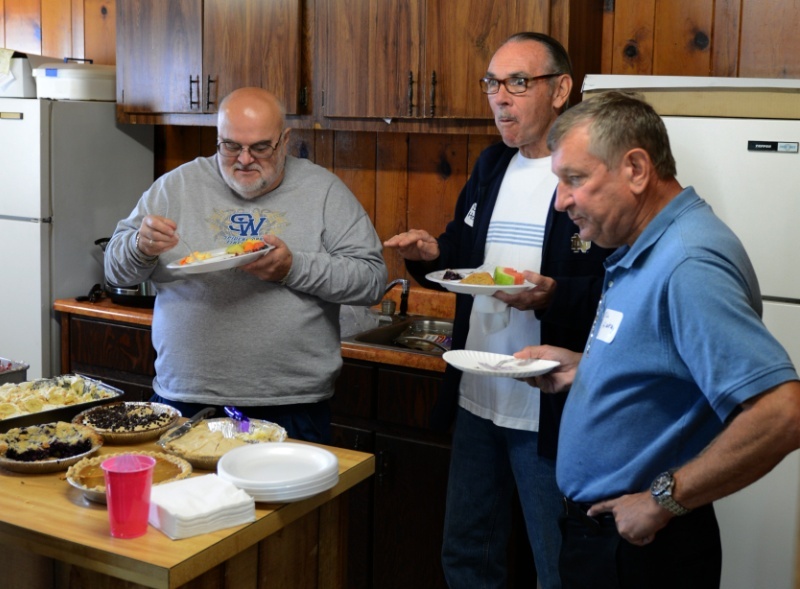 The men are Bill Hickey, Steve Cunningham, and Dave Hoskins. 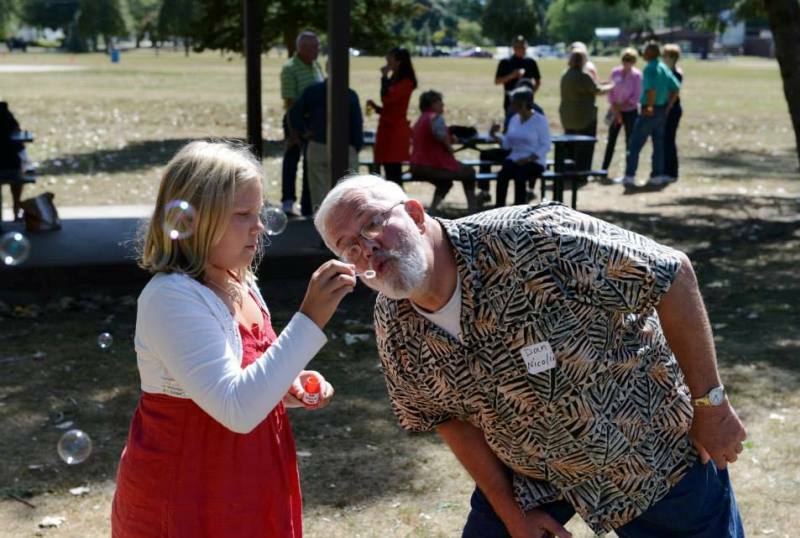 Above: Pat McGee's granddaughter and Dan Nicolini play with bubbles. 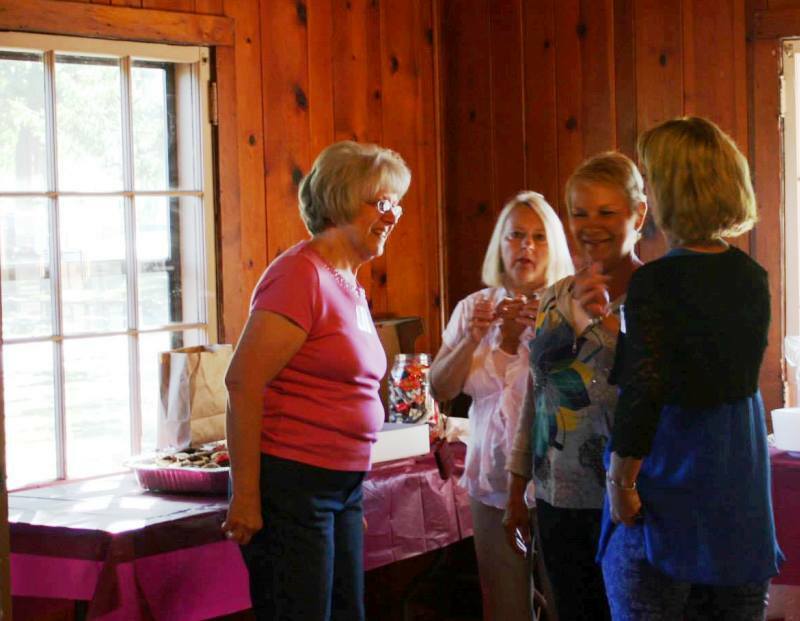 Eve Thompson brought bottles of bubbles and decks of cards as party favors. 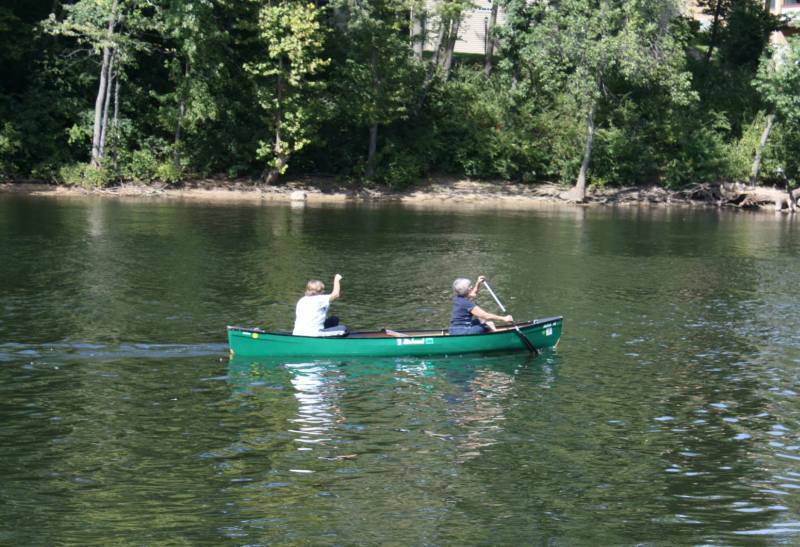 Above: Pat McGee and Mary Rhoade canoeing on the St. Joseph River. 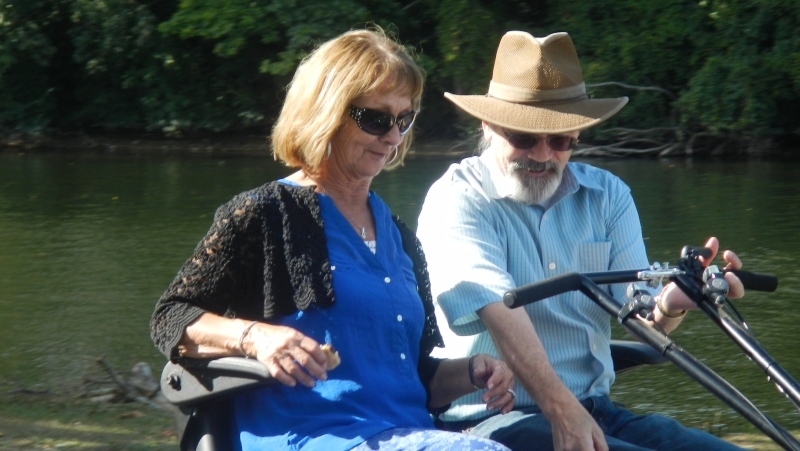 Pat brought the canoe, paddles, and life jackets and invited any and all to go out on the river. 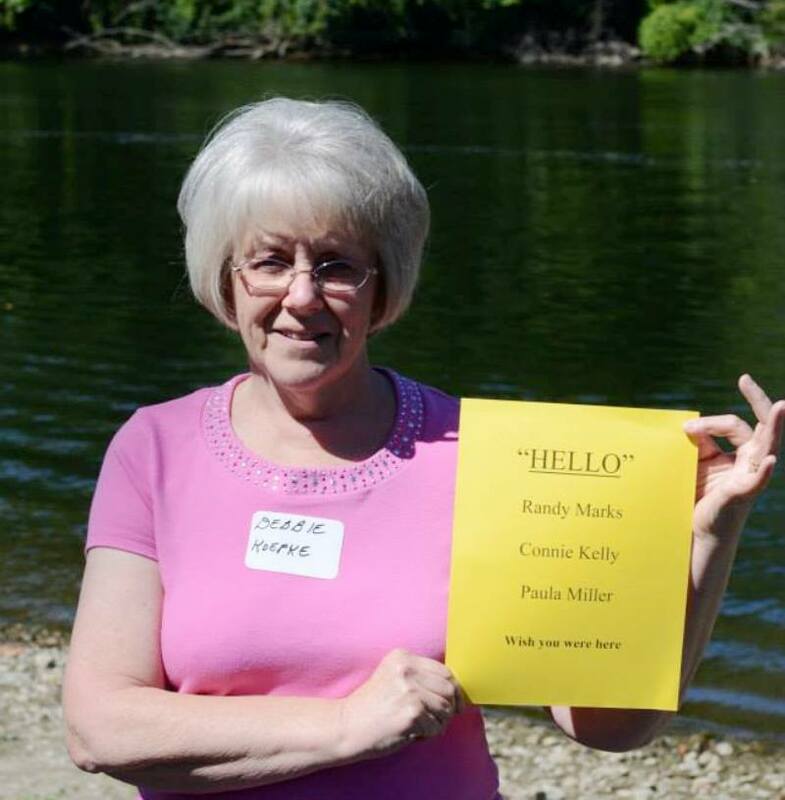 Above: From Debbie Koepke, "Hello, Randy Marks, Connie Kelly, Paula Miller. Wish you were here." 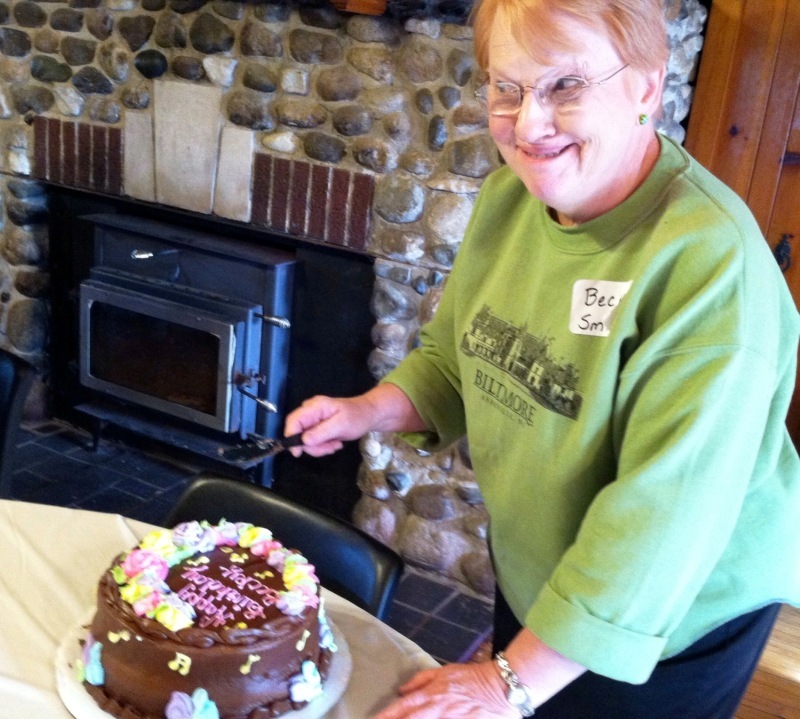 Above: In the evening, there was birthday cake for Becky Smith. There also was ice cream, and there were plenty of leftovers from the noon meal. We just kept eating all day. 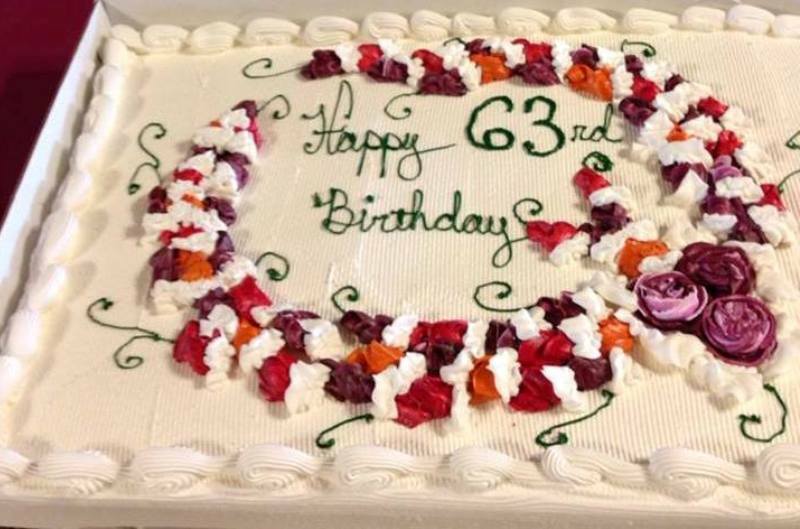 Above: Almost all of us turned 63 in 2013. There was a big sheet cake from West End Bakery. Above: When it got dark, we had fireworks. 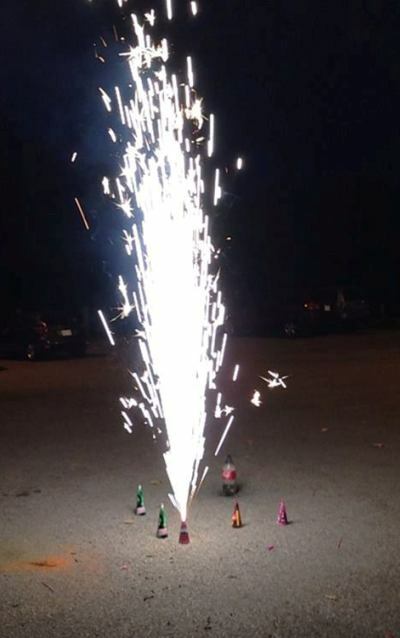 Terry DeMaegd brought some fireworks that shot into the sky. 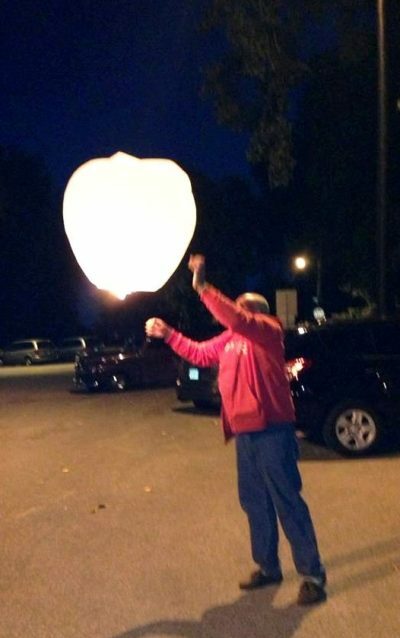 Spider Draves donated some fountains, sparklers, and hot air balloons. That's Debby Parnell's husband with the hot air balloon. Castle Manor cleanup was by everyone who was there, but it was Linda DeMeulenaere who did the final "scrub & polish" on everything.